This film is an Oscar oddity in the sense that it’s one of the four films to win Best Picture without receiving a nomination for Best Director. And all four times, it doesn’t make any sense. Wings and Grand Hotel were definitely strong directorial efforts for their time, but I guess the Academy didn’t know how to run things yet. This movie and Argo are more confusing, but you could argue that maybe so many voters assumed that their respective directors would get on anyway and didn’t vote for them. Did the direction deserve to be nominated? I son’t think I’ve seen enough 1989 films to say, but the directing here it’s fine. Bruce Beresford has the task of translating a Pulitzer Prize winning play (which recently had a revival with Angela Lansbury and James Earl Jones!) into a movie. And he does his job well enough. As for the film itself, I did enjoy the screenplay, but seeing how it’s based on a play, I imagine it wasn’t too difficult to adapt. Nevertheless, I did enjoy this movie because I did feel for the characters and what they were going through. The film really doesn’t do anything wrong, however it feels a little too small to be a Best Picture winner. Easily the best aspect of this movie is Jessica Tandy’s performance. Her acting is simple, doesn’t call attention to itself, and is beautiful. She also has good chemistry with Morgan Freeman, who is good in his own right. And Dan Akroyd does a humble job. 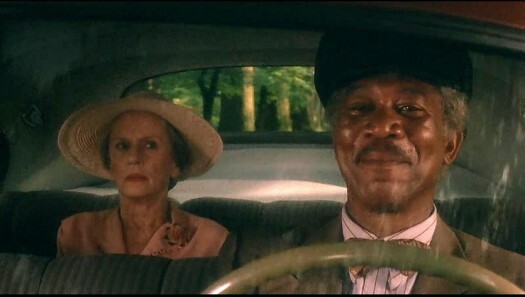 Originally, I was going to give this movie 4 stars, but I realized that in it’s own right, Driving Miss Daisy is a really good film. Only when you put it in a list of Best Picture winners does the film seem weak. It kind of reminds me of Nebraska. Charming film with a nice blend of humor and heart that only looks weak when you put it next to films like Casablanca, Godfather 2 and Amadeus. I like your review. I thought the play was excellent- better even than the movie!